- So we spent the weekend at the Great Wolf Lodge Resort. It has this pretty massive indoor water park with slides that go outside and back in plus an outside part with more pools and slides. That alone makes it a pretty unique resort but what I want to write about today more specifically is MagiQuest. - Think of it as a real life RPG. You buy these IR wands that are triggered with motion that sends a unique ID. Throughout the 8 floors of the hotel are items, big projection rooms, props, chests, video screens, etc scattered around that interact with these wands. 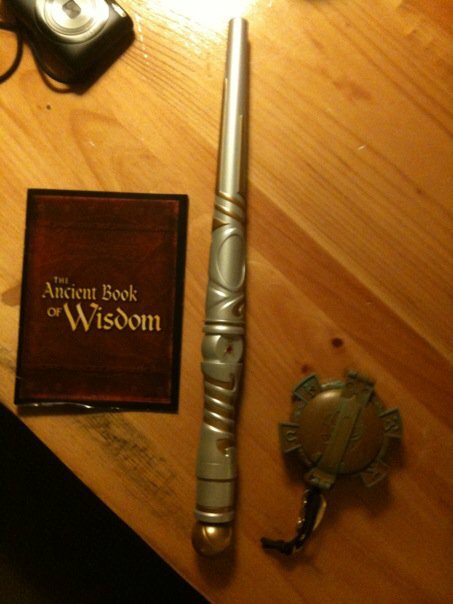 - The basic structure is you are trying to gather these runes of power. You have to complete a quest to acquire each rune. Most are basic fetch quests but some have some interesting twists, dependencies, and some minor puzzle solving. As you complete the quests you gain experience and gold. You'll level up too eventually reaching master magi. There are also random chests scattered about that you can farm for gold. A few of the quests require a gold amount (like 2000g) to pass but gold is rarely an issue if you just wand at all the chests you walk by. 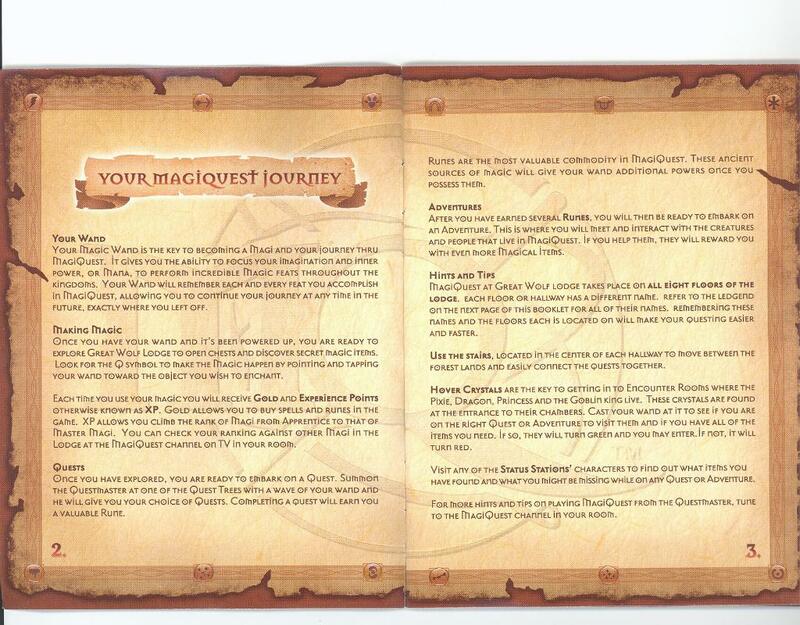 These rune quests are detailed in a quest book you get so they are pretty easy. Once you obtain all the runes you go on adventure quests which require the powers and spells granted to you by the runes you previously obtained. These are a bit tougher which you'll have to figure out on your own. 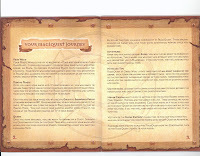 - Over 3 days of questing we only made it through all the rune quests and 2.5 adventure quests. 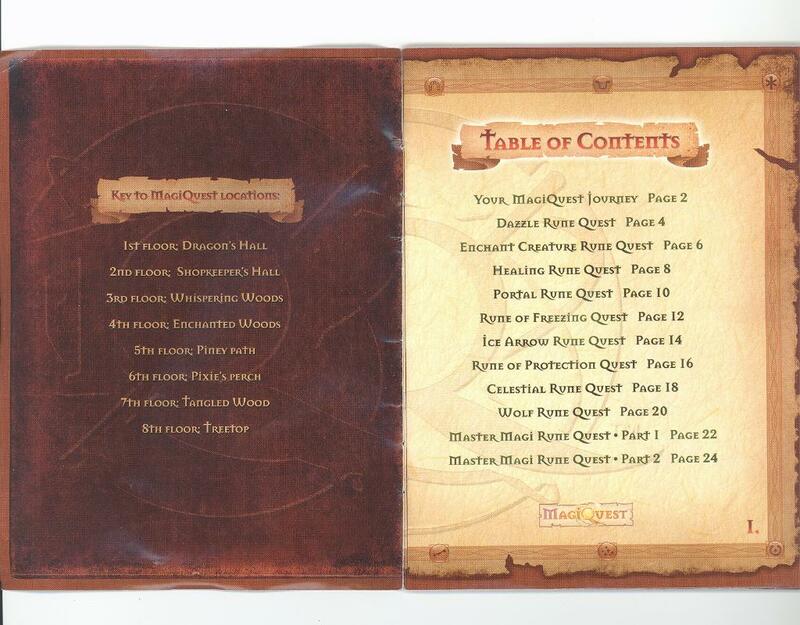 There were several more adventure quests and then a set of compass quests we didn't even have time to get to. There is a ton of content to do (10's of hours). I think it would probably take 5 days to do it all especially since you are required to take the hidden stairway instead of the elevators. Man, I must have climbed over 1000 steps (there is a LOT of backtracking). The kids could really only quest about 3-4 hrs before requiring a break. - The highlight had to be fighting Charlock the red dragon. There are several prerequisites you have to do, wanding runes in a specific order in an archway (portal) before you can entire, and finally the boss encounter where you fight Charlock requiring timing and multiple spells you gained from the runes. It's a bit like real life dragon's lair. The hardware is pretty impressive too which includes some treasure props, two big segmented lighted towers (that represents your health bar and the dragon's health bar), lights overhead, a big projection screen for the dragon, the IR sensors for the wand, and a touch screen for picking runes/spells. 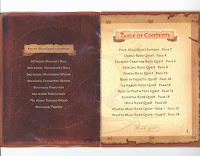 - There is quite a bit of narrative since every quest start and end has some fmv with a mix of CG and real life actors. Think syfy quality but in this case the cheesiness of it all matches. - So basically this like a real life MMO. There is quests, npc's (video ones anyways), loot, gold, xp, grinding, boss encounters, queues (sometimes lines develop for the boss battles) and pugging. Yeah that's right. I found that after a while you start talking to other families that are working on the same quests (you tend to cross paths a lot) or boss fights that you are both working on so you tend to share information and help each other out. - The wands work best by just shaking them back and forth so you hear the little switch click. That activates the IR beam. This works better than just waving the wand wildly but that works ok too. There are also different toppers you can get that screw in on the end of the wand. - Protip: If you want to be really efficient about it I would probably make a inventory list of all the objects each time you travel to a new floor eventually mapping out what is on each of the 8 floors. It should help a lot in the later quests and speed things up considerably instead of trying to remember where you saw a specific painting, the ruby gem, or that bird cage. Highly Recommended! My kids loved it and really got into it. If you just let yourself get into it, there is truly a unique experience that I think any MMO/RPG lover would enjoy. - After the implosion of Simplify Media (google bought them out) I was looking for a good audio streaming solution for my iPhone. I did NOT want to have to use Orb except as a last resort. Luckily I found subsonic which is an open source project. - Subsonic is the open source server piece which lets you stream your audio to any computer through it’s very nice and clean web interface (much faster than orb’s). It also supports several mobile phone clients for iPhone and android. For iPhone there are 2 options: z-subsonic and iSub. I chose iSub. - The licensing is kind of odd in that it requires a "donation" to use it beyond 30 days with the mobile clients. It's always free forever if you just want to use the web interface for playback. I have issues with using the word donation. I don't mind paying the $15 or so license fee but please don't call it a donation if it is required. - Installation is a snap, indexing music is super fast, service is lite weight and uses very little resources. - Artist view really is just a folder director structure view. I'm not sure why they call it artist since it's not dependent on id3 tag information. Actually, I prefer browsing by folders. - First thing after you install you might need to change the port from double clicking the tray icon. I had a conflict so I moved it some unused port. After that you fire up the browser interface where you can manage all your settings. - Go into Network settings and here you can create an easy to use sub domain for subsonic.org to get to your server over the internet. It's one nice feature you get with your donation. I don't use it since I already have my own domain and use dyndns.com. Also, I chose to manually setup my port forward. - One of the cool features of subsonic is transcoding. Not only is it good for transconding wav, flac, wma, etc to mp3 on the fly but you can also use it to down sample existing mp3's to a lower bitrate. This is great when you are streaming to your iphone and you want to restrict the amount of precious upstream bandwidth it uses. You can restrict bitrates on a player or user basis (so say on a browser you want a higher bitrate but on your iphone you want a lower bitrate). I just kept it simple and did it by user. I restricted max bitrate to 128kbps which I think is a good compromise of quality vs bandwidth. - Next, you'll want to setup your music folders. Add as many as you want and each path will show up as a subdirectory off of root. - There are a ton of other options to explorer. It even has a built in podcatcher but ummm yeah I use rcFeedMe for that. Status gives you a nice graph of who is streaming what and at what bitrate. About has a detailed log useful for troubleshooting. - Artist (folder) view is super fast for updating and browsing. Album/song view takes longer since the meta data has to be downloaded initially. I usually just stick to artist view since I have all my music nicely organized into a clean directory structure. - Seems to handle 25,000+ files without issue. - Buffering works really well already with quick music start up, scrubbing, and very little drops/stops. There is even a handy buffer status screen which shows you how full the buffer is currently. Note: the now playing info screen shows the bitrate of the mp3 file NOT the current rate it is streaming at. To check that look at the status screen in subsonic through a web browser. - You can create on the fly playlists or pull the ones created on the server side in subsonic. - The standard repeat/shuffle options are there. - Music nicely resumes exactly where you left off if you were interrupted or switch to another app during playback. Background playback is already implemented but that version hasn't been released yet. - There is an occasional crash bug here and there but it happens so infrequently it really doesn't bother me. The next version is almost a complete rewrite so it should be even better. - Album art works nicely (either as a separate image file or embedded into the id3 tag). - One great thing is how well supported and responsive the developer is. He is even implementing one of my features requests: bookmarks. I have missed bookmarks ever since I stopped using rockbox on my sansa e280. Bookmarks should allow me to save my place in different files if I happen to be listening to a podcast or audio book on my commute and then music while at work. Hands down subsonic + iSub is the most feature rich, flexible, open, robust music streaming system yet. Highly recommended!!!! !